This blog is dedicated to my attempt to run at least three miles a day for 366 consecutive days in 2012. This is a challenge that I have set myself which I really don't know if I will be able to complete. Still, if I don't start somewhere I will never find out. Time will tell. Was that a marathon pace run? Mmm, no. Ladies and Gentlemen, I present Mr. Beare.. Speed again? Twice in a year..
As you can tell from my interests, quite a lot of my time is taken up with running, planning to run, getting ready to run or working out what I can do next, in running terms. I am well and truly hooked on the marathon and ultra marathon bug and at the point of creation of this blog I have run 46 marathons and ultras to date. I limit my races to around ten a year to try to minimise the impact on my family. In the last two years, I have taken part in the LDWA's 100 mile plus main event of the year, in Scotland in 2010 and Shropshire in 2011. 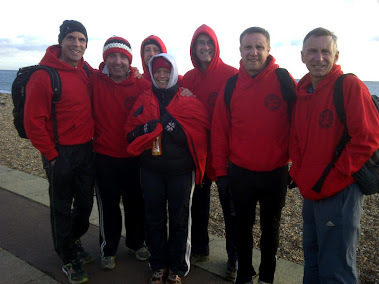 I have also along the way taken part in other great races, including London to Brighton twice, the Greensand Ridge run in Bedfordshire and the Lyke Wake ultra, as well as many great and not do great marathons all over the country and further afield. In 2012, I wanted to try something a bit different and run every day. I had to pick a leap year. I am also organising a 78 odd mile trail run for my club, Ampthill and Flitwick Flyers and going for my once a year PB attempt in October at Chester. At the end of the year, I will also run a coast to coast section, although I still need to plan that yet.